Dey Street Books, 9780062366689, 368pp. One of the music world’s pre-eminent critics takes a fresh and much-needed look at the day Dylan “went electric” at the Newport Folk Festival, timed to coincide with the event’s fiftieth anniversary. On the evening of July 25, 1965, Bob Dylan took the stage at Newport Folk Festival, backed by an electric band, and roared into his new rock hit, Like a Rolling Stone. The audience of committed folk purists and political activists who had hailed him as their acoustic prophet reacted with a mix of shock, booing, and scattered cheers. It was the shot heard round the world—Dylan’s declaration of musical independence, the end of the folk revival, and the birth of rock as the voice of a generation—and one of the defining moments in twentieth-century music. 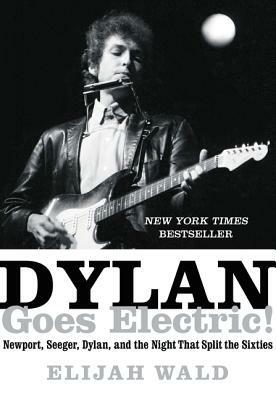 In Dylan Goes Electric!, Elijah Wald explores the cultural, political and historical context of this seminal event that embodies the transformative decade that was the sixties. Wald delves deep into the folk revival, the rise of rock, and the tensions between traditional and groundbreaking music to provide new insights into Dylan’s artistic evolution, his special affinity to blues, his complex relationship to the folk establishment and his sometime mentor Pete Seeger, and the ways he reshaped popular music forever. Breaking new ground on a story we think we know, Dylan Goes Electric! is a thoughtful, sharp appraisal of the controversial event at Newport and a nuanced, provocative, analysis of why it matters. Elijah Waldis a writer and musician whose books include Escaping the Delta: Robert Johnson and the Invention of the Blues and How the Beatles Destroyed Rock ’n’ Roll: An Alternative History of American Popular Music. A respected expert on the folk revival, he collaborated with Dave Van Ronk on The Mayor of MacDougal Street, the inspiration for the Coen Brothers’ film Inside Llewyn Davis. His awards include a 2002 Grammy, and he has taught blues history at UCLA and lectured widely on American, Mexican, and world music. He currently lives in Medford, Massachusetts.